Asian International School is a CBSE Affiliated State-of-Art co-educational, English medium school built on a 10 acre sprawling and serene green campus, with over 1, 00,000 square feet of facilities. The school is housed with the finest of amenities and infrastructure so as to provide an encouraging environment to the students, which in turn will give them abundant opportunities to realize their talents. A vast playground, generous patches of greens, airy rooms, tranquil atmosphere and liberal spaces will not only incubate the growth in the best possible manner but also shall provide an ideal and conducive atmosphere for stimulating young minds to explore their potential in perfect sync with nature. We at AIS believe every child is special and has a nascent talent that is waiting to be nurtured into a vibrant reality. At AIS we help parents to identify, encourage and give wings to this specific gift of their child. Every child is allowed to explore, discover and experience his/her own world. We encourage them to transform their dreams to reality and metamorphose them into bright individuals. Children learn to work with emotions and moods, to nurture an inner life, to love the world of ideas, to ask questions, and to be original thinkers. At Asian International School the endeavour is to create a “Centre of Knowledge and Excellence” that will strive to provide a holistic education experience that ensures high principles of academic excellence complemented by a kaleidoscope of co-curricular activities. The focus is on nurturing well-rounded personalities with the skills to excel in the world they will inherit in time. We boast of a team of teachers and academicians amidst us who are highly experienced and are regarded as institutions in themselves. Their constant supervision shall ensure that the quality shall never be compromised. 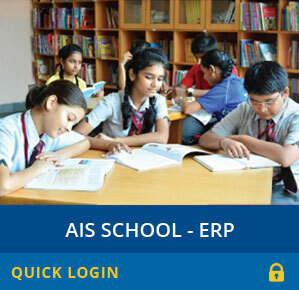 The school follows an AIS 3600 Model wherein all the people involved with the student shall work towards one mission ? EDUCATION FOR LIFE. We at AIS help parents to identify, encourage and to give wings to this special gift of their child. The school motto is to provide each student with the essential elements necessary for a holistic development. AIS will help in incorporating relevant psychological, intellectual, emotional, and moral values that will help students to recognise and respect their natural abilities & nurture them to reach their maximum potential.